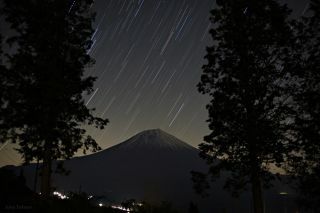 Star trails shine over Japan’s highest mountain, Mount Fuji. Veteran skywatcher Ajay Talwar took a spectacular photo of star trails over one of the world’s most stunning natural wonders—Japan’s Mount Fuji. The World at Night astrophotographer captured this image in May 2012. Star trails, where the stars' movements streak across the sky,can be shot by opening the shutter at a time-exposure of 30 seconds and taking several images. The natural rotation of the Earth creates the look of the star trailing across the night sky. The images can then be stacked together in Photoshop to create one composite photo. Mount Fuji in Japan is the tallest mountain in the country and one of the Three Holy Mountains in Japanese culture. It’s still an active volcano that last erupted merely 300 years ago.